Functions of Compost Turners uses modern technology to deal with organic wastes, such as the dung of livestock and poultry ,the litter of agriculture and animal husbandry, household refuse, filter mud, sludge, waste residue, distillers’ grains, etc. Compost tuner uses modern technology to deal with organic wastes, such as the dung of livestock and poultry ,the litter of agriculture and animal husbandry, household refuse, filter mud, sludge, waste residue, distillers’ grains, etc. It aims to decrease the harmless of such waste, improve soil condition and crop quality. It is the ideal equipment to converted part of the pollution source and organic waste into high-quality biological organic fertilizer. This compost turner machine is widely used to ferment all kinds of organic wastes into top-quality compost in large farms and middle- or large-scale organic fertilizer production plants. It can be used both in indoor and outdoor compost system, for both family-use and industrial use. Instead of steering wheel, Two pull rods are specially designed to control the forward & backward of the machine, which is the spotlight! 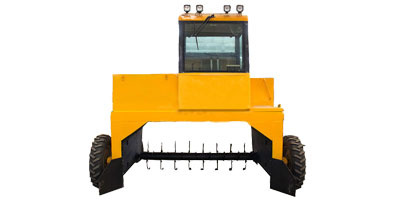 No reviews were found for Best Selling - Semi Hydraulic Wheel Compost Turner. Be the first to review!